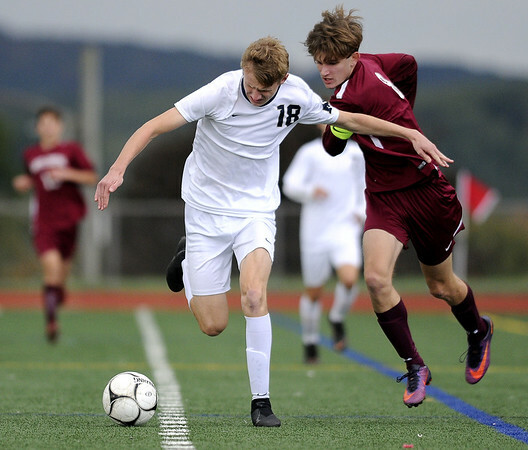 NEW BRITAIN - The boys soccer state tournaments are set. The CIAC announced the Class LL, L, M and S brackets Friday, with seven of the New Britain and Bristol area schools - Newington, Bristol Eastern, Bristol Central, Plainville, Goodwin Tech, St. Paul and Innovation - learning their postseason paths. The Indians were the lone school to make the LL tournament, securing the 25th seed after going 7-5-4 this season. But Newington will have a tough first-round opponent when it takes on No. 8 Glastonbury (11-3-2) on the road on Tuesday at 2 p.m. Should the Indians pull off the upset, they will play the winner of No. 9 Trumbull (10-2-4)/No. 24 Hamden (8-6-2). Both the Lancers (8-5-3) and the Rams (6-6-4) qualified for the Class L tournament. No. 16 Bristol Eastern will face No. 17 Maloney (7-4-5) at home on Tuesday at 2 p.m. and will face top-seeded Wilcox Tech (15-0-1) should it advance. Bristol Central, meanwhile, comes into its first-round match as the 22 seed and will face No. 11 Ellis Tech (10-5-1) on the road on Tuesday at 4:30 p.m. If the Rams win, they’ll play either No. 6 East Lyme (12-3-1) or No. 27 Middletown (5-8-3). The Blue Devils and Gladiators each earned a spot in the Class M tournament. Plainville (8-7-1) is the 23rd seed and will be up against No. 10 Montville (12-4-0) in the first round on Tuesday at 6 p.m. If the Blue Devils win, they’ll take on the winner of No. 7 Bullard Havens (12-3-1)/No. 26 Northwestern (7-7-2). Goodwin Tech finds itself back in the postseason after a 7-7-2 season. The 27th seed, the Gladiators are at No. 6 Brookfield (11-1-4) on Tuesday at 2 p.m. Goodwin Tech would then face either No. 11 Tolland (11-3-2) or No. 22 Bulkeley (8-5-3) in the second round if it advances. In Class S, St. Paul (10-3-3) and Innovation (9-6-1) both have first-round matchups on Tuesday at 2 p.m. The seventh-seeded Falcons will take on No. 26 Coventry (5-8-3) at home and will then face No. 10 Hale Ray (10-5-1) or No. 23 Immaculate (7-8-1) if they win. The Ravens are the 14th seed in their first season of eligibility and will host No. 19 Windsor Locks (7-6-3). The winner of that match will then face No. 3 Somers (13-2-1), which has a first-round bye. Posted in New Britain Herald, Berlin, Goodwin Tech, Innovation, New Britain, Newington, Plainville, Southington on Friday, 2 November 2018 22:36. Updated: Friday, 2 November 2018 22:38.